Siren Communications worked on an exciting campaign with global charity, Made By Dyslexia, to increase awareness around dyslexia with five short films. 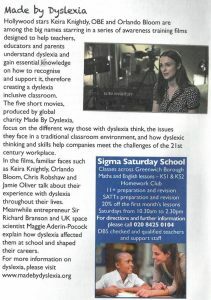 Starring some of the biggest names in Hollywood; Keira Knightly, OBE and Orlando Bloom, these awareness training films were designed to help teachers, educators, and parents to understand the condition and gain essential knowledge on how to recognise and support it; therefore creating a dyslexia-inclusive classroom. Microsoft is a firm supporter of the initiative, using the films to create a free online training resource about dyslexia on its popular Microsoft Educator Community – available to teachers and parents globally. This was announced at the education trade show, BETT, on Friday 25 January. Siren secured two live interviews on Sky News with Kate Griggs, founder and chief executive of Made By Dyslexia, and UK space scientist, Maggie Aderin-Pocock MBE. They were featured on Tom MacLeod’s ‘Lunchtime Live’ at 11.30am and ‘The Kay Burley Show’ in the afternoon. It was a great platform to shout about the charity’s work, where they discussed the purpose of the videos and how Made By Dyslexia is helping the world to properly understand and support dyslexia. This meaty coverage was nicely complemented by a half page editorial in Primary Times, a magazine read by parents, teachers, and pupils nationwide. Working in PR means you often have access to inspiring people and organisations, but despite the wow-fatigue, sometimes there is a truly special moment that makes you pinch yourself. For the last couple of months we’ve been supporting our friends at live event and experience agency Innovision on the world’s first Global Dyslexia Summit hosted by charity Made By Dyslexia. The Summit brought together high profile dyslexics including Sir Richard Branson, Kelly Hoppen MBE, Chris Robshaw and the Rt Hon Matt Hancock MP to call for a change in how dyslexia is understood and supported. Designed to deliver a powerful showcase of the strengths of dyslexic individuals and their incredible contributions to successful organisations and teams, the Summit content really packed a punch. We learnt how successful dyslexics have harnessed their dyslexia to visualise creative innovation, to keep things simple, to find confidence through excelling on the sports field, to tell stories in new ways, to break codes and even convince those around them to reduce a reliance on email (amen to that). And of course a huge amount more. 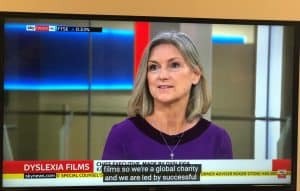 Our PR support for the Summit began with a bang seeing Made By Dyslexia founder and CEO Kate Griggs broadcast into the morning routine of the nation with an appearance on BBC Breakfast. Achieving broadcast business news coverage ensured that thinking differently about dyslexia was a theme for media interviews throughout the day. We were thrilled to land coverage across multiple radio stations and TV news outlets – more than 250 mentions to be precise, and detailed pieces in titles such as the Evening Standard. The incredible Made By Dyslexia team secured commitment from Microsoft to be the first global business to take the #MadeByDyslexia pledge to ensure that their people with dyslexia can realise their brilliant potential. Yet further additional weight was added to the story of the Summit by the unveiling of a Value of Dyslexia report conducted by EY. The first report is its kind to be developed by a team of dyslexic people, findings outlined how the talents of dyslexics can overcome future skills gaps challenges facing business productivity and economic success. We hope you feel as impressed and inspired as we are by this phenomenal charity – take a look at some of their powerful videos here. If you want to know about our work for charities and major events, please get in touch and don’t forget to commit to the #MadeByDyslexia pledge on social media and share your support for diversity of thought. We were on the road last week with our sister brand within the Siren Communications Group, Essence Communications, and it’s client, Barbados Tourism Marketing Inc., helping to make their ‘Taste of Barbados’ roadshows a big success. The week-long tour was the latest stage of the BTMI’s ‘Year of Culinary Experiences’, which has included multiple press and Influencer trips, a collaboration with Hello Fresh, and other experiential activations across a programme designed to bring Barbados to life through its cuisine, and showcase the whole island through something that is absolutely at its heart – its food and drink. Roadshow events took a delegation of Barbados hoteliers, representatives from the BTMI, as well as a Bajan chef, mixologist and band, from Dublin to Glasgow, Edinburgh, Manchester, Knutsford and London. In each location, trade partners, travel agents, tour operators and media were immersed in the sights, sounds and tastes of Barbados and reminded of what makes it one of the most popular destinations in the Caribbean for UK holidaymakers. In turn, the positive reaction of attendees to each event demonstrated why the UK remains Barbados’ biggest overseas source market, and why UK visitor figures are 3% up year on year. Hands-on cocktail and cooking demonstrations, live music straight from St Lawrence Gap, the chance to win exciting raffle prizes, and the opportunity to hear about latest developments from Barbados, was the order of the day in each location, for a combined total of more than 350 people. Judging by the photos, a great time was had by all! Last week, Siren’s Celebrity Cruises team was busy as we worked with our client to deliver an exclusive ship yard tour of their new ship Celebrity Edge, in Saint-Nazaire, France for a hand-picked group of top-tier trade, consumer and cruise specialist media from the UK and Ireland. Little did they know that, while there, they would also be the first to learn that the next ship from Celebrity Cruises’ Edge Class series, Celebrity Apex, will be launched and be named in the UK in April 2020. Our group included representatives from The Sunday Times, Mail Online, Sleeper Magazine, Travel Weekly, TTG and the Daily Telegraph, and fellow journalists from across Europe and the US. They were hosted on their tour of Celebrity Edge by Richard Fain, Chairman and CEO of Royal Caribbean Cruises Ltd, and Lisa Lutoff-Perlo, President and CEO of Celebrity Cruises. They were shown Edge’s Stateroom with Infinite Balcony and twin-level Edge Villas, the swimming pool deck, Eden restaurant and The Spa, and the ship’s iconic, world-first Magic Carpet cantilevered dining space which hangs over the side of the ship itself. Throughout the day, they were immersed in to the thinking behind the transformational design of the ship, and Celebrity Cruises’ signature ‘modern luxury’ reimagination of a holiday at sea. Their tour also included a reveal of the Grand Plaza, the final signature component of the Celebrity Edge experience by Jouin Manku Studio, and the beating heart of the ship’s design story. This immersive space will embody the heart and soul of Celebrity Edge with the aim to completely transform the way guests connect to the world at sea. The surprise announcement about Edge’s sister ship, Celebrity Apex, represents a major commitment by the Celebrity Cruises brand to the UK market, and is the first time in a decade that Celebrity Cruises has named and operated a ship from the UK. More importantly, this will be the first time Celebrity Cruises will operate two ships from the UK’s busiest port, Southampton, as Celebrity Silhouette will also return in 2020 for its third consecutive year. Two such significant announcements inevitably created a lot of buzz in our target media. Breaking across social media, the news was picked up by The Daily Telegraph Online, Travel Weekly and TTG in minutes, with local Southampton-area media also running it through the day. Coverage has continued since, meaning interest in Edge (and now Apex) remains high as we get ever closer to the official inauguration later this year. Our Love Your Commute campaign activity for MBNA Thames Clippers continues and the most recent fabulous on-board event saw the river bus service partnering with Vintage Books for a spot of bibliotherapy. On a grey morning, river bus passengers had access to Vintage’s experts to be paired to their perfect book from a selection of great commute reads. We love a freebie as much as the next person, but the feel-good factor went beyond nabbing a new read at no cost when London’s commuters chatted to the publisher’s experts and… to each other! Londoners, on their way to work, having conversations #MindsBlown! We’ll be digging into Meg Wolitzer’s The Female Persuasion courtesy of the event, but the MBNA Thames Clippers commuters had the choice of more than 10 books ranging covering many literary preferences. The series of monthly #LoveYourCommute activities, aimed at enriching that usually dead time travelling to and from work, has also seen mindfulness mornings, brain-boosting smoothie giveaways and a photography masterclasses. We are busy planning the rest of the year’s events but in the meantime, anyone for a floating book club?